Today is Valentine’s Day, and it is a special time for me. When I was a small child, my brother, Tim, and I would ride the “BIG” Illinois Central Railroad train, “The City of New Orleans” or the “City of Miami,” to Chicago, Illinois, to visit our Aunt Mary. Every time we went to visit her, she would take us downtown to the original Fannie May candy store. In 1920, H. Teller Archibald built the company’s first retail store at 11 N. LaSalle Street in downtown Chicago. As their business grew on the premise of making handmade, delectable chocolates, with absolutely no compromise on quality, their stores began to expand to meet the demands of the citizens of Chicago. The company continued to grow, expanding to 48 stores in Illinois and surrounding states in the Midwest. As World War II began, Fannie May faced ingredient shortages because of the war effort. Mr. Archibald refused to change the original recipes that he had developed because he believed it would degrade the quality of his chocolates. As a result, many of his stores had to close. The company started expanding their stores and began to purchase other candy companies. Over time, the financial burden of these investments caused Fannie May to file for bankruptcy in 2002. 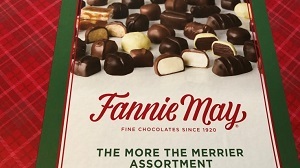 Other candy companies ultimately purchased the original Fannie May recipes, and they are back in business today providing the same wonderful chocolates that I enjoyed as a small child. What started with the gift of Fannie May chocolates from my Aunt Mary has continued with the giving of Fannie May Valentine’s Day chocolates in our family. My mother began a tradition of giving my siblings and me a small heart-shaped box of Fannie May candies on Valentine’s Day, along with a handwritten card to each of us letting us know that she loved us. When my mother died, my dad continued the practice. I give my wife, Sondra, Fannie May Valentine’s Day chocolates each year . . . and have done this for over 50 years. When our children were born, we started the tradition of giving them Fannie May candy, along with a handwritten card expressing our love for them. As our children married and had their own children, we expanded our tradition to include our grandchildren as well. I still remember receiving and giving Valentine’s Day cards to all of my schoolmates in grade school. We used to tape a brown paper sack to the back of our school desks, and when you were not looking, someone would drop a “Won’t you be my Valentine?” in our sacks. These are great memories! I am happy to see that this is still being done in one form or another by my grandchildren. They bring home little cards and candies from their classmates. What are YOUR Valentine’s Day traditions? I would love to hear your stories and traditions that you uphold in your families. Happy Valentine’s Day to all!